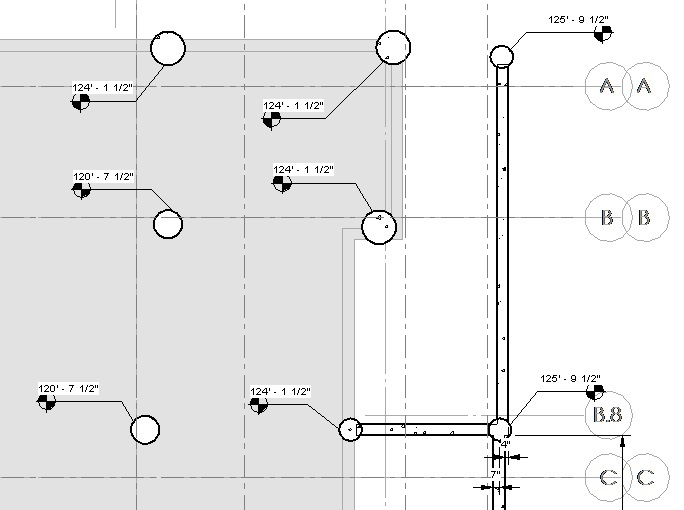 When I first came back to working in Revit, I wasn’t convinced of the need to separate “working” views from “plotting” views. I’d never used them in AutoCAD, why start now? Can’t you just hide stuff you don’t need? Gotta say, though, I became a fan pretty quickly. What changed my mind? When you’re working in 3D, a 2D view doesn’t always tell the whole story. (Or even half the story.) Want to see what’s really going on in your plan? Cut a section! Didn’t quite answer the question? Cut another section! Before you know it, your view is chock full of section cuts that you don’t actually need as part of your set. Rather than letting section cuts clutter up your views, at our office we change them to a “working section” type and use a filter to turn them off in plotted views. We’ve found it helps eliminate confusion between what’s a “real” section and what’s not. I was modeling an existing structure the other day, and I needed to keep track of the top of caisson elevations. The easiest way to do this was to tag them all with spot elevations — but I did not want that information on the actual plan. Instead, I hopped over into the working view and tagged away. They didn’t have to look pretty, because they’ll never appear on paper. I like to think of working views as the digital equivalent of scratch paper. You can scribble all you want, knowing you won’t mess up your sheet. And if you decide later that you do need some of those annotations or sections on the plotting sheet, you can easily copy the annotations or change the section back to a regular type. The one caveat I would give for working views is that if you change something real, like a wall or a door, you’d better go back and check that in your plotting view to make sure it still looks the way you want it to. Real annotations such as dimensions and spot elevations should follow their hosts, but detail components might not and text notes definitely won’t. Have you ever noticed that people tend to blame software for project problems? Or worse, for people problems? I’ve been thinking about this for a while, and decided to post after I read Robert Green’s Cadalyst series on the “tool worship trap“. These articles describe how easy it can be to get caught up in the promises of new software (and yes, I’ve been there! ), and the reality checks you need to be sure your expectations don’t get out of hand. But this attitude has a flip side: fear of new technology. Or if not fear exactly, a transference of existing issues onto new software. I’m mostly thinking about Revit today, but there will probably be more examples in a future post. Basically, whenever I hear a complaint or an objection to a Revit-based process, I try to find out if it’s an issue now anyway, regardless of software, and whether it’s something that we could fix if we just talked to the person on the other end. Revit’s not perfect. (Far from it…although it is getting better all the time.) But I don’t think it deserves all the blame it accumulates for problems that are either long-standing collaboration challenges — that could be just as true for two people working on a Word doc — or that can be traced to other project management issues.